Librarians are available all the hours that the library is open. They are also available by appointment. In addition to helping students with finding resources for research projects, they also provide guidance on citation style, avoiding plagiarism, and technical assistance. Students, faculty, and staff with a ID can check out library materials as described below. Faculty can place books, articles, or audiovisual material on reserve in the Closed Access Collection so that all students have access to it in the library. All faculty are invited to suggest materials for the library to acquire. Faculty requests for materials to support the curriculum will be honored as fiscal resources permit. Among libraries in Indonesia, this forum is known as In-CUVL ( Indonesia Christian Universities Virtual Library). In December 2010, the Forum of Librarians & Theological Seminary Libraries in Indonesia joined BK-PTKI. UPH library members may visit and use the collections at these libraries for reference purposes. UPH library members may visit and use the Bank of Indonesia's collection for reference purposes. The Library provides retrieval and delivery of articles and selections from journals, magazine, newspapers, reference books, and other publications, in print or digital format, upon request. To use this service, contact a reference librarian by email at library@uph.edu. Requests will normally be filled in 3 days or less. Johannes Oentoro Library members will not be charged for this service or the digital delivery of documents but will need to pay a per page fee for any printing requests (see Table of Fees). 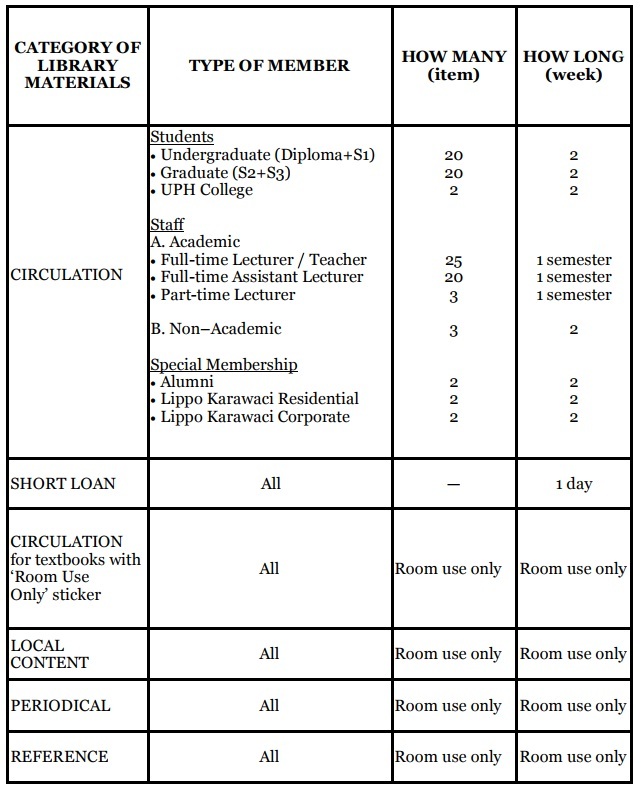 Non-member and institutional network libraries will be charged according to the Table of Fees. Payment should be submitted to Nobu Bank, account number. 101-3011-8888, on behalf of the Yayasan Universitas Pelita Harapan. Documents will be delivered to the requester via e-mail in PDF format or by mail (postage fees will be charged) as soon a copy of the bank transfer sheet is faxed to the library reference department at 021-5460908. For more information, please contact our staff at 021-5460901, ext 1371/1370, or via email at library@uph.edu.